Fife distillery Kingsbarns has launched its first flagship whisky, a three-year-old single malt named Kingsbarns Dream to Dram. 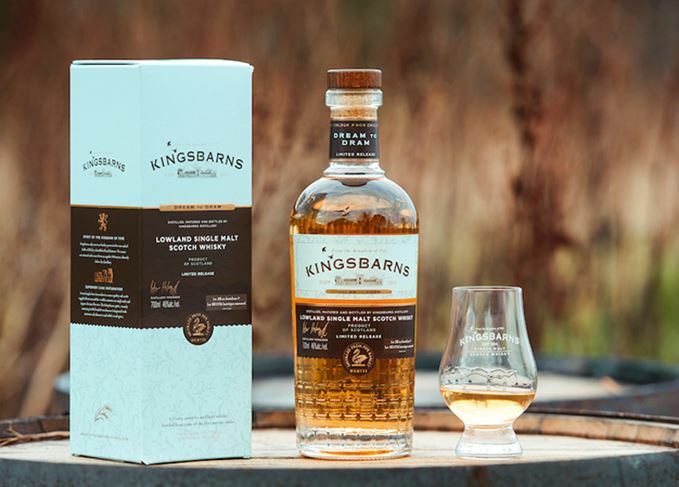 The single malt, produced exclusively using barley locally grown at the distillery’s East Neuk home, is Kingsbarns’ first whisky aged to a minimum three years to be released for general sale. William Wemyss, owner of Kingsbarns distillery, said: ‘Dream to Dram is a wonderful single malt that I think perfectly captures the Lowland style and the character of our East Neuk home in Fife. The whisky is said to be ‘clean yet complex’ with ‘banana, pineapple syrup and summer berries’ on the nose with ‘soft toffee and custard pastry’ on the palate. Bottled at 46% abv, 90% of the whisky has been matured in first-fill ex-Bourbon barrels from Heaven Hill distillery, while the remaining 10% has been aged in shaved, toasted and recharred wine casks. Priced at £44.95 per 70cl bottle, the whisky is currently available from the Kingsbarns distillery website and specialist retailers across the UK. The whisky is also ‘on its way’ to being released in some European countries and Taiwan, with a more widespread release in the near future. Kingsbarns distillery was opened in 2014 by the Wemyss family, owners of Edinburgh-based independent bottler Wemyss Malts, in an effort to realise the family’s ‘long-held dream’ to produce single malt whisky in Fife. Although Dream to Dram is the distillery’s first general release, it follows the limited release of Kingsbarns Founders Reserve in December 2018, another three-year-old available exclusively to members of the distillery’s Founders Club. The Fife distillery’s spirit, aged three years on 23 March, is now officially Scotch whisky. The Lowland distillery’s first whisky will be sent exclusively to Founders’ Club members.